Happy hours focused on beer. Lots of them. Cheers, buds. In our continued Shanghai Beer Week coverage of all things beer -- and our interest in saving you money, dear reader -- here are over 30 deals and happy hours at bars and brewpubs around town. For more deals, check out our dedicated Deals page. Also, we realize that perhaps some of your favorite beer venues are not on this list. Well, maybe tell them to pick up the phone next time you're down there. 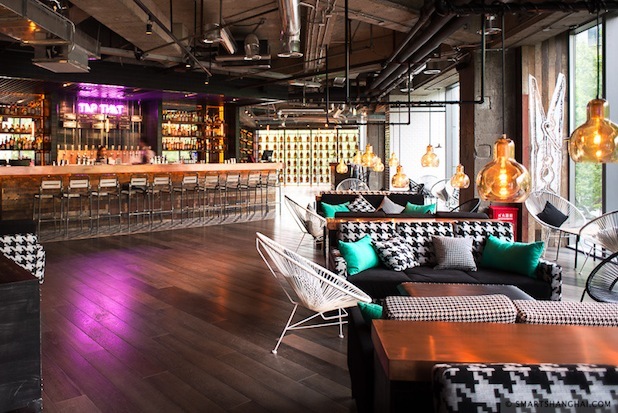 If you're a venue with a happy hour, let us know by listing your event on SmartShanghai. And as always, deals change constantly and without warning. Call ahead to double check. The Fenyang Lu outpost of the German brewpub that started that whole German beer trend here has a happy hour from 4pm-7pm. Their three draft beers are 50% off. So their 500ml drafts are 40rmb instead of 80rmb, and 1-liter drafts that are usually 150rmb are 75rmb. Glasses of wine are around 30rmb a glass. Nice beer garden here, too. Boxing Cat on Yongfu has a fine happy hour at all their locations on Monday to Thursday from 5pm to 8pm and Friday to Sunday from 3-8pm. 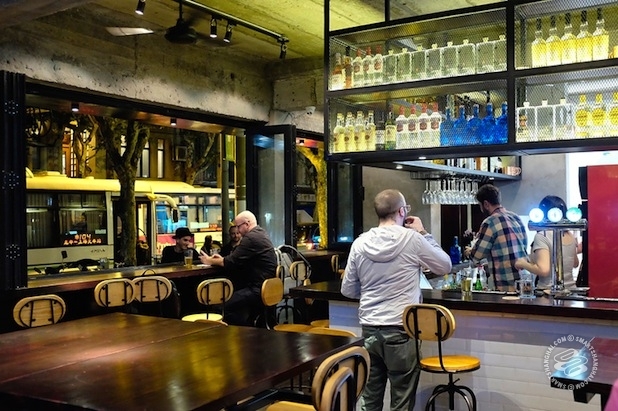 Pints of their microbrews, glasses of house wines, and house pours are all 35rmb. Pitchers of beer are 100rmb. Good times. This one on Yongfu has a patio and a fireplace. Also, pints and house pours are 25rmb from 5pm until close on Mondays. You should try the 12-pint challenge. It's such a great idea. From 2pm to 8pm on weekdays, Shanghai Brewery has a 30% discount on their beers (all brewed onsite). Pints that are usually 48rmb are 33rmb. They've also got discounts on cocktails and wine. On weekends the happy runs from 4pm to 8pm. Wednesday is a big salsa night here, if you're into that. They've got different food deals every day too. The café of the interns was the first bar on Yongkang Lu. Their weekday happy hour from 4pm to 8pm remains popular (especially with a French crowd) that takes 5rmb to 10rmb off their draft beers and house wines. Beers on draft include a few varieties of La Chouffe. On weekends, the happy hour runs from 2pm to 6pm. 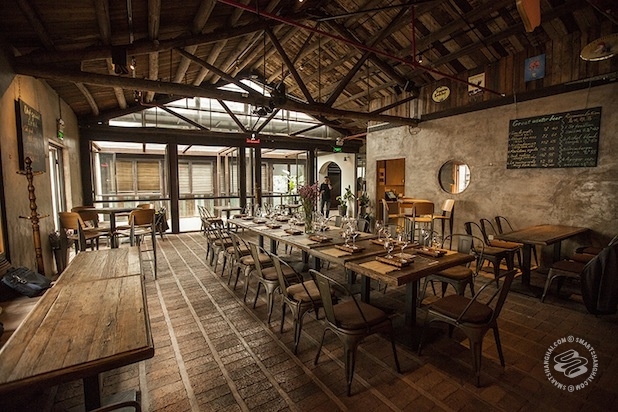 The more modern outpost of Shanghai Brewery has a slightly different happy hour. It's still a 30% discount on the beer, but from 3pm to 8pm. On Monday to Friday from 4pm to 7pm, LL serves all their house beers for 30rmb; house wine and cocktails are 50rmb. Solid deal. They've usually got about 12 different beers and at least a couple rotate every month. Great place to sample some microbreweries from around China -- they've got about 40 rare beers on tap. The happy hour runs from 12pm to 8pm every day, with a 15rmb discount on their beers and house wines; so that's that's 35rmb to 45rmb on their twelve draft beers. Huge, huge rooftop patio here as well. Recommended. If you drop 100rmb average per person at LL, you'll get free flow beer from the featured keg of the night. You have to ask for it -- they really don't push it. It runs out when it gets busy, so get there early if you're going for this deal. Resident DJ Caution plays hip hop and funk throughout the night, though this is more of a sit down and chill affair than a dance party. Good vibes, and can be super busy, especially around 8pm to 10pm. Goes from 8.30pm to close. The Old Captain Bar in the Sunrise on the Bund Hotel makes their own Munich Lager, dark beer, and wheat beer. You can get buy-one-get-one on those from 4pm to 7pm every day. Then after 9pm, they offer the beers free-flow for 99rmb. Call ahead to make sure they are open to the public and the deals are available as they often rent out the space. 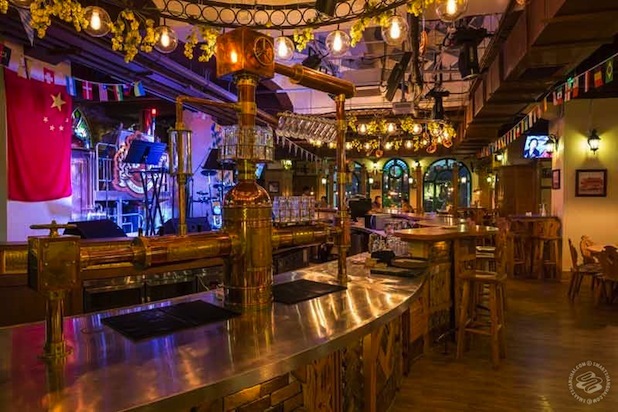 Every day from 11am to 6pm, this German brewpub in Hongkou does 50% off their home brewed lager, wheat, and dark beers. The beer was super fresh on a recent visit, and you can get pretzels for 12rmb. Offer applies to all beer sizes. The Brew is the spot for craft beer in deep Pudong. Paulaner's Expo location does 50% off alcoholic beverages from 4pm to 7pm every damn day of the week. For the after-work crowd in deep Pudong, The BREW does buy-one-get-one on pints of their house-made beer (it's real good) from 3pm to 8pm. So that works out to about 80rmb for two pints after the service charge and tax. Lots of outdoor seating here and a full menu. Occasionally, the space is rented out for events, so call ahead before you go. This stock exchange-themed bar in the basement of the Pudong Shangri-La offers buy-one-get-one on house wines, their own Exchange Lager, and Asahi draft. Available daily from 4pm to 8pm. Munich Beer House in Pudong offers buy-one-get-a-refill on select draft beers, including their wheat and dark beers. So you can't pass your second drink to your friend, but you do get another for free. Available daily from 3.30pm to 7.30pm. Kaiba in Tianzifang. Chill spot. Spread The Bagel has a big patio and a daily happy hour from 3pm to 8pm, with Boxing Cat draft beer for 30rmb and house pours for 40rmb. That's about as cheap as you're gonna get in Xintiandi. This beer bar/restaurant in Xintiandi does live nightly music and offers a happy hour from 11am to 8pm. They offer buy-one-get-one free on their light beer and a dark beer. A pint for one of these is 68rmb. Available daily. Just across from Fuxing Park, this Boxing cat has pints of their microbrews, house wines by the glass, and house pours for 35rmb Monday to Thursday from 5pm to 8pm and Friday to Sunday from 3pm to 8pm. Pitchers of beer are 100rmb. Nice patio here on the street. The Contender Ale comes recommended. On Mondays, pints and house pours are 25rmb from 5pm to close. Kaiba in the Taikang Terrace by Tianzifang offers a daily happy hour from 10am to 9pm on weekdays, and 10am to 7pm on weekends. Their 10 draft beers get a 20-30% discount during those hours. Paulaner Xintiandi does buy-one-get-a-refill on all their alcoholic beverages, including their beer from 2.30pm to 6pm. Again, can't pass that second beer to a friend. Bummer. Kaiba on Wuding Lu has twenty beers on tap. Their daily happy hour runs 10am to 9pm on weekdays and 2pm to 7pm on weekends, with a 30% discount on all draft beers. Not bad, eh. De Refter is a Belgian beer bar on super chill Jinxian Lu. Good option for after-work suds and those who cruise higher gravity booze highway. They have eight beers on tap and they offer a 20-30% discount on them during their daily happy from 4pm to 8pm. Intern-run bar Le Cafe des Stagiaires on Dagu Lu does their happy hour from 5pm to 8pm on weekdays and 4pm to 8pm on weekends. They take 25-30% off all alcoholic beverages, so that includes beer, wine, and cocktails. They're loud and busy, but smoke-free. Beergrdn right in the heart of Jing'an hosts a daily happy hour (including Saturday and Sunday) in their terrace garden from 5pm to 8pm. Discount drinks from 35rmb -- craft beer, cocktails, wine, and more. The Rooster's Jing'an spot has a happy hour from 5-8pm on weekdays. They offer 10rmb off all draft beers, cocktails, bottles, and wine. They've got beers like Jing-A, Kentucky IPA, Cider Republic, Dead Guy Ale, and Boulevard Pale Ale on tap. Indeed, the doctor has a happy hour Monday to Thursday from 5pm to 8pm. They do 40% off select drinks. They brew a lot of their own beer and some of the tables have individual taps. Nice environment with decent patio space and a full food menu. 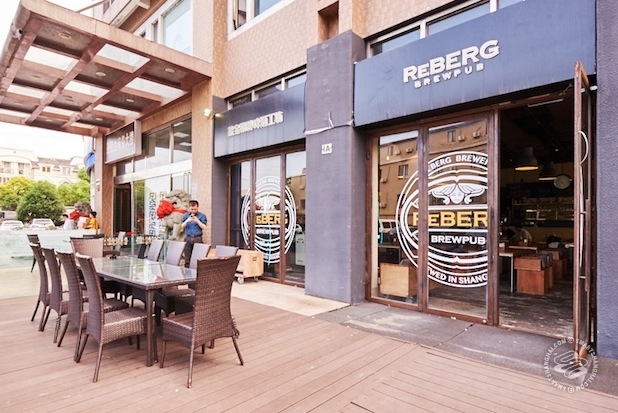 ReBerg is the only brewery in Shanghai with a QS. That's why you see their bottles in shops. Reberg Brewpub has a daily happy hour from 4pm to 8pm. They offer buy-one-get-one on their draft beers which include Dunkel, Hefeweisen, and Pilsner. They do a lot of b-day parties and big groups, so they recommend that you call before you go. Also, they have a playground you can drop your kids off at while you booze. That's just good parenting. Over on Laowai Jie, Shanghai Brewery's happy hour runs Monday to Friday 2pm to 8pm and Saturday and Sunday 4pm to 8pm. Discounts depend on the drinks, and some 300ml glasses of beer are 25rmb and some pints are 33rmb. Other beers, cocktails, and house wines get different discounts. The first Daga, over on tranquil Tai'an Lu, has a lot of rarer selections from microbreweries around China. 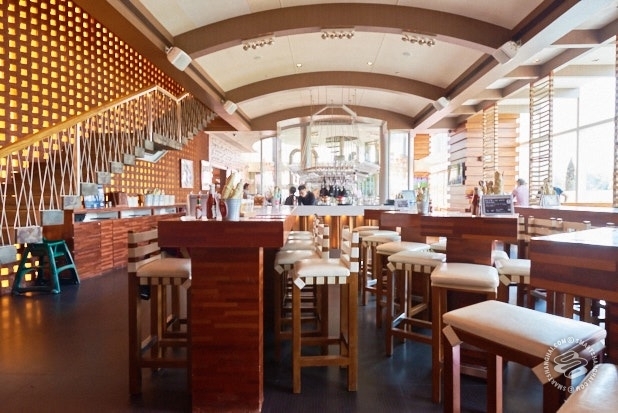 Their happy hour runs from 12pm to 8pm every day, with a 15rmb discount on select beers and house wines. Boxing Cat's Hongqiao branch offers buy-one-get-one on their beer (330ml glasses) from 3pm to 8pm on weekdays. On Saturdays and Sundays, the happy hour changes to a discounted 35rmb per pint instead of the buy-one-get-one. That also runs from 3pm to 8pm. Kaiba on Dingxi Lu has eight beers on tap, which they discount by 30% from 10am to 9pm on weekdays, and 11am to 7pm on weekends. Wow. Who's drinking Belgian beer at 10am. (Answer: Belgians.) Decent patio here. Old brewpub on Laowai Jie, Papa's Bierstube has only one happy hour and it happens on Tuesday. Yep. It's a classic "buy-two-get-one free" on their home brewed beer. Pints go for around 50rmb. Available all day. There are more. We tried to call you guys! No one answered the phone! Forecast says: Updates are possible.